Over a century ago, archaeologists discovered what appeared to be a Neanderthal burial at La Chapelle-aux-Saints in southwestern France. They've been arguing about its true nature ever since. 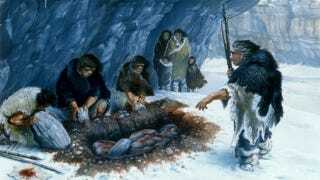 But after a 13-year study, it now appears that Neanderthals did in fact bury their dead. The burial, which took place in what is now southwestern France, took place some 50,000 years ago during the Middle Paleolithic just prior to the arrival of modern humans. The configuration of the site indicated a burial, but some archaeologists have surmised that the burial may not have been intentional. Looking to resolve the issue, archaeologist William Rendu and his team returned to the area in 1999 in search of more clues. Their new excavations, which ended in 2012, revealed more Neanderthal remains, including two children, one adult, and bones of bison and reindeer. The archaeologists failed to locate any tool marks or other evidence of digging where the initial skeleton was found, but geological analysis of the pit in which the remains were found strongly suggested it was not a natural feature of the cave floor. What's more, after a taphonomic analysis of the original Neanderthal remains (the newly discovered bones didn't appear to be buried), the bones showed few cracks, no weathering-related smoothing, and no signs of disturbance by animals. The body, for whatever reason, was buried very quickly after death (perhaps as a way to protect the body from scavengers). "The relatively pristine nature of these 50,000-year-old remains implies that they were covered soon after death, strongly supporting our conclusion that Neanderthals in this part of Europe took steps to bury their dead," noted Rendu in a statement. "While we cannot know if this practice was part of a ritual or merely pragmatic, the discovery reduces the behavioral distance between them and us." Read the entire study at PNAS: "Evidence supporting an intentional Neandertal burial at La Chapelle-aux-Saints."